Suzuki Karimun is city car with length 3,410 mm, width 1,575 mm and height 1,705 mm. This is my car after I have Chevrolet Zafira. 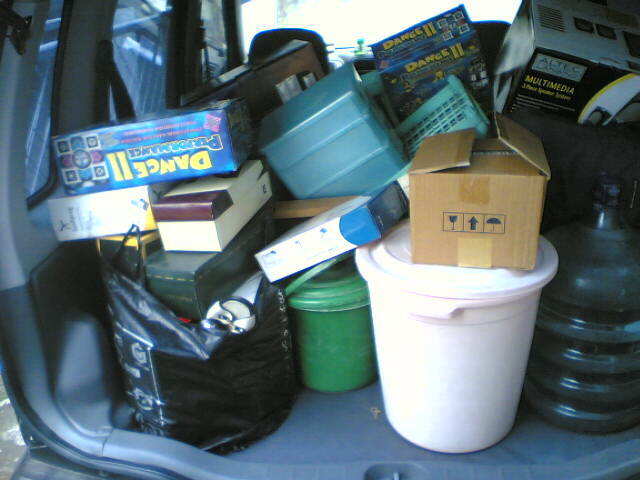 Karimun is a small car; the capacity is only for five persons. Even, if I tried to use the gearbox, my hand often grazes person leg beside me. 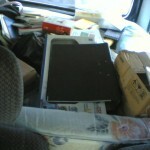 Today, my sister-in-law wants to move from her place to my brother place. At first, she wants to pay someone to help her. But then she asked me to help her. 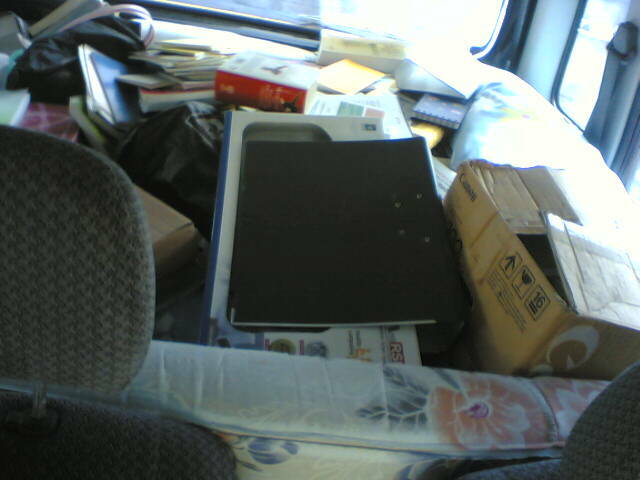 At 12:00 pm, my brother, my sister-in-law and me go to the place that we want to move things. I folded the passenger seats so the floor became flat and the capacity increased. 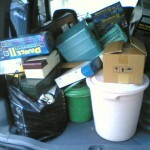 This is some picture that show how much the Karimun capacity. But, my brother and me must go back three times before all completed to move. All finished at 7:00 pm. One of my cellphones is Nokia 6585. And the operator that I use is Esia, the communications company that uses CDMA technology. The price to make a call is very cheap. To make a call to the same operator is about $0.006 or 0.6 cent per minute. And if you call for an hour the price is reduce just $0.11 (but you must call one hour, and after one hour the price is $0.002 or 0.2 cent). The coverage of Esia is just Banten, West Java and Jakarta. I live in Bandung and sometimes I go to Depok, West Java to meet my parents. My girl also lives in Depok. So the way we keep our relationship is only with phone call. In Indonesia, the internet is so expensive and not reliable. So, I can’t use a video chat. And my choice to make a phone call with my girl is Esia. To make call from Bandung to Depok we must add a prefix 01010 before the phone number. But, a few days a go, I can’t call my girl using that prefix. If you don’t use that prefix the price is $0.16 per minute. Just this morning I received sms for Esia that told me to use prefix 010100. What a long prefix to make a call. I have Sony Ericcson M600i. I bought it about 2 months ago. I like this phone. At first, this phone hangs so often. But after I upgraded the firmware, the phone is much faster and doesn’t hang again. About a week ago I was going back to my parent’s house at Depok, West Java. I went there with bus and when I wanted to come back I decided to use travel because it is faster and more comfortable. But, I couldn’t call the travel to make reservation. I told my dad and I asked him to drive me back to Bandung, but he didn’t want to drove me. I tell this story to my girl and she wanted to drove me with her car because her little brother wanted to go to Bandung. At 7:00 pm, my girl came to my house to pick me up. At 7:15 pm we departed. I’m the driver. When I sat down in the driver’s seat, my phone slips and fall. And at that same time I closed my driver door. With the probability one in a million, the door hits the phone. The LCD is broken. The cost to replace it is about $75. It’s very expensive for me as a student.